Anyone know where I can find the rear ac compressor bracket that was used in 68 only? Have you checked RockAuto or Classic Industries? I must have checked about 50 vender along with EBay and part number searches. 1968 only, big block only, Chevy or Chevy and gmc trucks. They use to be repo; but no longer. i have heard there is a guy specializing in Chevy pulleys and brackets connected with camaro forums. Last edited by Jim larson; 05-09-2018 at 11:27 AM. I am not sure about the guy you are referring to, but is this the part you need? 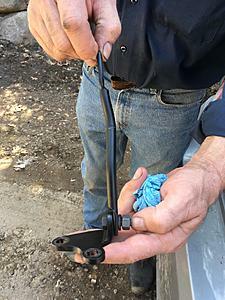 Thanks, No, thats the rear adjustment brace, works for 65-68, lots of venders have that. here is a photo with the lower attachment bracket that I have along with the other 6 brackets/braces, etc. Last edited by Jim larson; 05-09-2018 at 02:22 PM. Yes thats the lower bracket that bolts to the exhaust manifold. I have an original one as well as a bunch of original bolts. What I need is the rod that bolts to that lower bracket and the back of the compressor and the rear adjustment brace that was mentioned before. My best option is probably a swap meet and look though a bunch of chevy brackets, etc. From your picture, it looks like those are the 3 parts. The first one I linked is the bar, the second is the bracket, and the 3rd is a full set of bolts. What am I not seeing? No the rod in the photo is complete different then the rear adjustment brace, although they attach to each other and also to the the rear of the compressor. The one link you post is the lower bracket that this odd rod attached to. Your other link is a set of bolts for mounting the kit and produced by AMK. You may have never seen this rod as it is only used on 68 big blocks with air. Sorry I think I might have read you post wrong, yes ther are 3 parts in the photo. A rod, a bracket, and the attaching bolt/nut. I just need the rod. Call up Classic Industries if you are in doubt. *Pics* 918 compressor, cc987 setup, ring compressor.